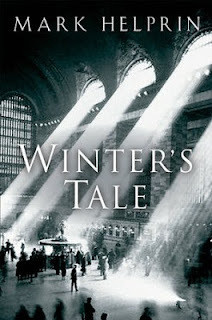 Chances are, if you've read Mark Helprin's 1983 novel Winter's Tale, you loved it. It's even mentioned sometimes as a "favorite novel of all time." This, sadly, will be a dissenting opinion. I haven't not finished a novel since 2002, but this one nearly broke that streak. Finish it, I did, though. And I was relieved beyond measure when it was over. I don't mean to sound jerkish, but I really had trouble understanding the allure of this. "He knew that, in the eyes of God, all things are interlinked; he knew that justice does indeed spring in great surprise from the acts and consequences of ages long forgotten; and he knew that love is not broken by time." Another theme seems to be that we can't understand everything in the world through our senses, or science, or logic and reason. Okay. Fine. But it took us nearly 700 pages of flying horses and "cloud walls" and giant mysterious ships and people returning from the dead and incredibly descriptive descriptions (redundancy intentional) of New York City to get there. If you're not familiar, Winter's Tale is often categorized as a "magical realist" novel, so weird stuff is always happening. I can dig it, and that wasn't my problem with the book. My problem was that it just felt incredibly overwrought, and ultimately, just tiresome. I really struggled with it. It reminded me of a Thomas Pynchon novel, without near the quirkiness or humor. It had a bit of the feel and scope of a Charles Dickens novel, only without the super intriguing characters and interesting, page-turning story. Or, if you like, it felt like a David Mitchell novel, but without near the smarts. On the plus side, I really did enjoy the first 200 pages — which starts in the early 20th century and tells the story of an orphan thief named Peter Lake, who grows up with a tribe across the Hudson called the Baymen, but then is set adrift in New York City as a teenager. Eventually, during a robbery, he falls in love with the beautiful daughter of the city's newspaper mogul. Peter has various adventures in the city, including dodging the evil gang leader Pearly Soames, and his gang of Short Tails, who keeps trying to kill him and his beautiful white horse Athansor. But then, the story jumps forward to right before the turn of the 20th century and tells the tale of a number of New York residents, who all came to the city with their own unique origin stories and expectations of the city. And then Peter Lake comes back to life. And so does Pearly Soames, whose mission, for some reason, is still to kill Peter. So, in a case like this (the only other example from my reading I can think of where I was so annoyed by a book everyone else loved is Cormac McCarthy's Blood Meridian), where I'm clearly in the minority, I'm hoping you can help. What is the allure of this book? Why did you love it? What did I not see, or understand? It's been awhile since I read AWT but I do recall enjoying the lyrical mix of fantasy and Dickensian style writing set in New York. Perhaps,it's just not your cup of tea there. Don't feel too bad about taking that much time with the book-I finished Martin Chuzzlewit this week(after several months)and while parts of the book lagged,the experience was great over all. Now embarking on Les Miserables and that big boy will probably take up the rest of the year,classical reading wise! Definitely not my cup of tea - I like long books and I don't mind taking my time with them, but this one was just not for me. Good luck with Les Mis! Oh no! I've long been looking forward to reading this book. I hope I feel differently. I do tend to have trouble with novels that are as you've described and lately all I feel I can handle are short stories. But I love magic realism... Would you try A Kingdom Far and Clear? http://www.amazon.com/Kingdom-Far-Clear-Complete-Editions/dp/1606600125 or have you sworn off him? I haven't sworn off Helprin, but we needed some extended time apart. I havent read Helprin. But I think the "magic realist" part leads to me NO. Thanks for the warning. I only made it through half. Kudos to you for finishing. This was a DNF for me....and I really loved the first few hundred pages. I do usually like Helprin and still plan to read his new book. But your review makes me feel better about never finishing this novel (a secret until now...). I didn't read this review. I have been recommended this novel three times in the last 24 hours and I guess that's enough to merit a reading. But judging by the title of your blogpost, you didn't like it. This (oddly enough) has only intrigued me more. This book really connected with me in a personal way. The way love in general is described almost identical to the poems I wrote my first lobe who I look back in to this day as the one who got away...separated by time and tragedy but endless and still as strong as ever.